In a web browser, connect to the HQueue server (http://hostname:5000/). Click the Jobs icon at the top-right corner of the web interface to go to the jobs page. Remote management from the web console uses SSH to connect to the client hosts. If remote management fails, make sure sshd (the SSH server process) is installed and running on the host, and that HQueue has the correct username and password for the host. See how to submit a job. You can create jobs using the API, as well as query information about running jobs, and manage jobs. See the API documentation for more information. Click the Job ID in the job table. Click Reschedule failed jobs below the job table. "Rescheduling" a job places the job back on the scheduling queue where it waits for an available client. Rescheduling a job also reschedules its parent jobs and any failed child jobs. On the Jobs page, find the job in the list. Check the box at the start of the job row. Click the Reschedule button below the job table. On the Jobs page, find the job you want to cancel in the list. Check the box at the start of the job row. Click the Cancel button below the job table. When a job is paused, it is halted on the assigned client machine. The job remains in the scheduling queue where it waits for the user to either resume or cancel the job. Pausing a job also pauses its child jobs. To resume a paused job, turn on the checkbox next to the paused job and then click the Resume button below the job table. Click Delete failed jobs below the job table. When a job is deleted, it is permanently removed from the system. Deleting a job also deletes its child jobs. You cannot delete jobs that have not completed. On the Jobs page, find the job you want to delete in the list. Check the box at the start of the job row. Click the Delete button below the job table. The top of the page lists "active" and "running" jobs. "Active" jobs include running jobs, as well as their child jobs. "Running" jobs doesn’t include the top-level jobs that are just wrappers for child jobs and do not run on any clients. Jobs are sorted into separate tables for running jobs and completed jobs. Allows you to select a job. You can apply actions to selected job(s) using the buttons below the list. The job’s unique identifier. Click on the id to view the job’s details. The job name and description. The user account that submitted the job. The job’s priority. Jobs with higher priorities are assigned to clients before jobs with lower priorities. 0 is the lowest priority. The job’s status. See Job Statuses. The amount of work completed specified as a percentage. The status of child jobs. The first number in the column displays the number of finished child jobs while the second shows the number of total child jobs. If there is any failed/cancelled/abandoned child job, the column would add a message at the end saying "n failed" where n is the number of failed child jobs. This column shows the elapsed time for running jobs and the time to complete for completed jobs. Elapsed time: the duration of time that the job has been running. Time to Complete: the amount of time for the job to complete. The estimated amount of time left until the job finishes. The time when the job was submitted to the farm. Indicates whether the job has a note attached to it or not. Note exists. Hover over the icon to view the note. Click the icon to view the note’s full thread. No note. Click the icon to add a note. 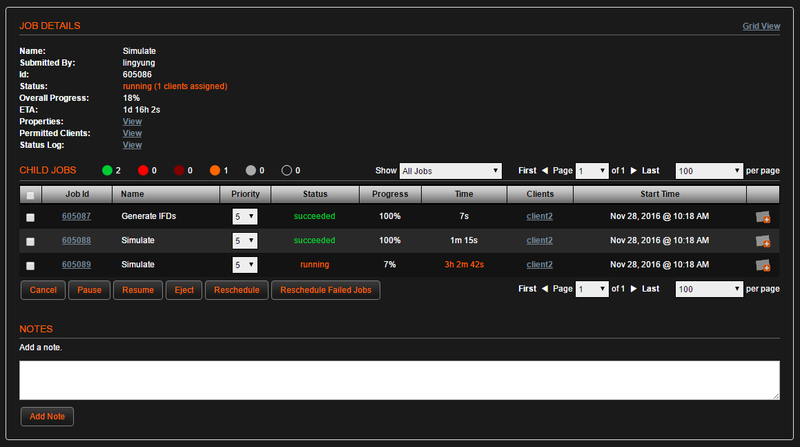 Click a Job ID in the job table to view the job’s details. You can manage child jobs using a job table interface like the one on the top-level job page. Click the Grid view link (to the right of the Job Details header) to switch the child job table to a compact view that shows the status and run times of all child jobs. Click Table view to return to the default view. The jobs that depend on this job. Click on a parent job’s id to view its details. This field is hidden if the job has not parents. The clients assigned to process the job. This field is hidden if there are no clients assigned to the job. The amount of work completed by this job and its child job specified as a percentage. Click the View link to see a list of the job’s properties. Click the View link to see a log of the status changes. This field is hidden if there are no status changes. The script that is executed after the job finishes regardless of whether it succeeded or failed. This field is hidden if no such script has been assigned to the job. The commands that the job executes if the job is assigned to a client machine. This field is hidden if the job has no commands. The combined STDOUT and STDERR outputs of the job’s command set execution. Click on the 'Download Output' link to download and view the full command output. This field is hidden if the job has no commands. Click the View link next to Properties on the job details page to view these properties. See job properties for more information. The time when the job was added to the server queue. The time when the job was marked as available for assignment to a client machine. The time when the job began execution of its command set. The time when the job finished execution of its command set. The time when the job started running on the assigned client machine. The time when the job finished. The amount of time for the job to complete. The amount of time that the job spent waiting before it started execution on a client machine. This field does not appear if the job has not started. The amount of time that the job took to finish execution. This field does not appear if the job has not finished. A set of client conditions with every two lines corresponding to a condition. A client machine must match the conditions in order to be eligible for processing the job. This field does not appear if the job has no conditions. A set of client’s environment variables. This field does not appear if no environment variable is set.